For more than a week, the establishment press has been reporting on nearly all aspects of the Judge Brett Kavanaugh confirmation process – the Senate Judiciary Committee hearing last week, Democrats’ claims of this and that, the White House’s perspective, and which GOP senators are said to be “wavering” in their support for a superb jurist where opposition to his ascension to the high court has been so carefully orchestrated by Leftists and the Democratic Party. But again, the press has reported on nearly all aspects. One little detail the “mainstream” media appears to have overlooked relates to retiring RINO Jeff Flake’s decision to change his mind regarding a final confirmation vote on Kavanaugh after voting to move him out of committee for consideration by the full Senate. You may recall that shortly before the Judiciary Committee voted, Flake announced he would support Kavanaugh. Then he was ambushed outside the Senate chamber as he tried to get on an elevator by two women, one of whom started screaming and claiming she was a victim of sexual assault. For four minutes she verbally berated and hollered at Flake who, by any measure, would have been well within his rights to have ignored her and insisted that, if she can’t be civil, he was under no obligation to listen to her. 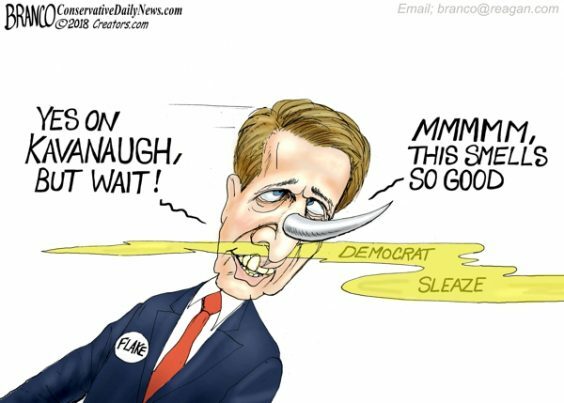 Shortly thereafter and following private talks with Democrats, RINO Flake said he would only support Kavanaugh if the committee agreed to allow the FBI a week to look into various allegations of sexual assault against him – allegations that have all but been refuted by various sources and evidence. Thanks to Democratic Socialist congressional candidate Alexandria Ocasio-Cortez, we now know that Archila is an illegal alien, per The College Fix. If that isn’t bad enough, it gets worse: Funder of domestic terrorism, George Soros, has his filthy hands all over this. Big League Politics reported that Archila is also the co-executive director for the Center for Popular Democracy and the Center for Popular Democracy Action Fund (notice how Left-wing Marxist-communists always refer to themselves as “democratic”). Previously, the Washington Free Beacon reported that the CPD is funded primarily with money from Soros. He provided CPD with $130,000 from his Open Society Foundation in 2014 and an additional $1,164,500 the following year. The fact that Soros funds Marxist groups isn’t news; he’s done that for decades and frankly, it’s high time he was investigated (and charged?) with “meddling” in our elections. But funding a group co-directed by someone who isn’t even supposed to be in the country, and then that person is successful in changing the mind of a swing-vote RINO senator means that Soros, indirectly, may have just affected the composition of the Supreme Court. Whoever says our political system doesn’t need any reform isn’t paying attention. Read more about George Soros’ election meddling at Soros.news.